It has taken me several years to find my happy work spot at home. 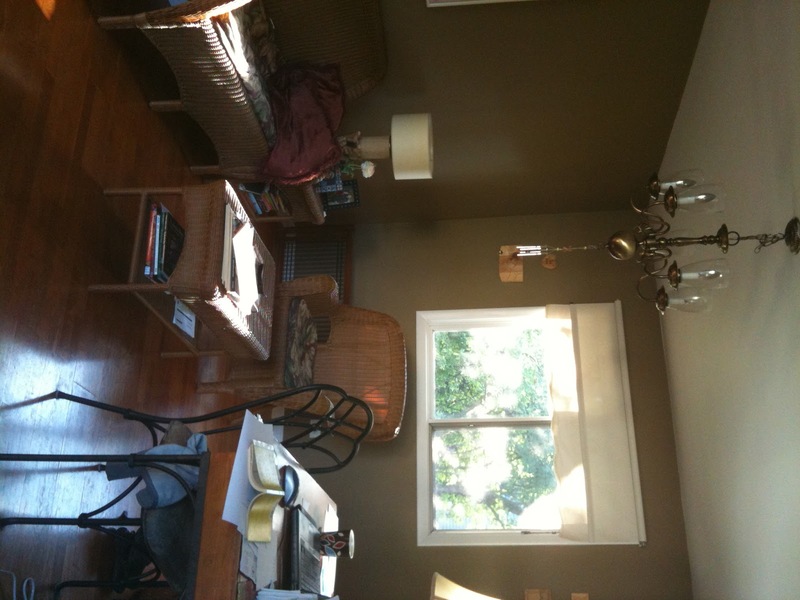 I have had my desk in our bedroom, in the family room, and in the dining room along with the dining room table. A few years back we moved the dining room table into the kitchen and made the dining room my very own office space. I love it! I have windows on both sides of me. If I look to my left I see a large tree in our backyard which usually has a few squirrels chasing each other up, down, and all around. In the morning the sun gently makes it way through this window. If I look to the right I see out to our front yard and witness all the neighbors running/walking by, rabbits munching on our plentiful dandelions, and have my Izzy nearby sitting in her favorite chair. By late afternoon the sun is pounding its way through this window and I either embrace the sun or closed the curtain a bit and hide from it. It is a perfect work environment. When the kids wake up several hours after me they immediately head into my “office” area. I can either turn away from my laptop in my desk chair or take my tea and move over to another chair and talk with them a bit. I love when they come and hang out with me. On Saturday mornings, Steve will often do the same thing. He will head out for coffee and come back and sit with me in my “office”. I don’t miss having a dining room at all! Be Who You Are and Your Natural Beauty Shines! I'm so happy for you in your “perfect space.” I'm sure it induces creativity! So often, underutilized rooms remain that way, instead of being converted into more optimal space. Good for you for kicking the formal room to the curb and opting for something practical, yet fun and ingenious for you! Thrive with RA, your work space sounds absolutely wonderful. I was visualizing it as you described it. Very nice.